From Dale Howey: "I was only there for two hours, and shoveling popcorn into bags much of the time so didn't take too many pictures. 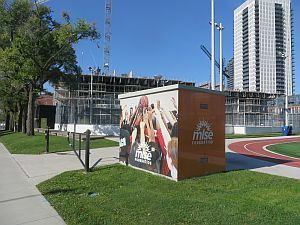 It will be interesting to see both what the city intends to do next year and what Regent Park can do without MLSE....There was lots of city staff, and it seems like there was a significant effort by the city to make it a good event." Food and swag are free on that day, so there are lineups and crowds. Several youth volunteers were sent over by Dixon Hall. The arrangement is that the youth, although called "volunteers," are actually paid, and if they don't do much work that's fine because it supposedly keeps them out of trouble. The funder is the Daniels Corp. This was the same situation last year at Family Day. 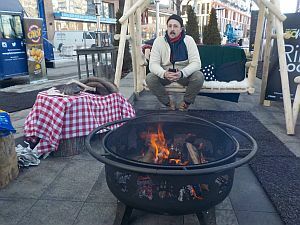 Many people think that paying youth to do little or nothing because they are troubled in some way, or just because they live in the area, is a very bad idea. But that's somewhat part of the local culture, i.e. the city rec staff are usually also underemployed during their supposed work time. 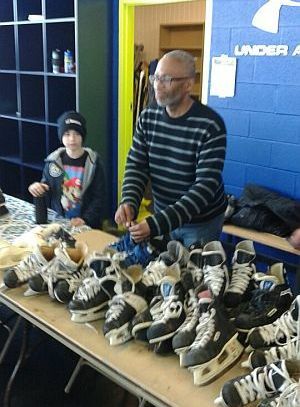 From Dale Howey: "Two volunteers seemed to be doing the skate lending. There weren’t many skates on the shelves as they were all lent out but I didn’t look to see sizes. With a third of the room filled with cookie decorating it was pretty crowded. I’m not sure what the turnover rates but when I looked there were maybe 10 pairs on the shelves." 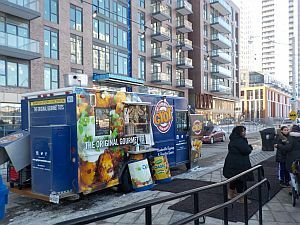 food truck serving "tater tots"
There were many rec staff in the building, mostly clustered around the information desk. A few looked like staff who work there normally. 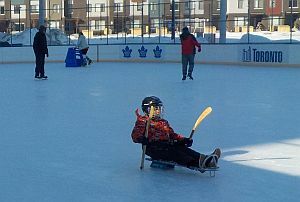 Many had been sent from other rinks or community centres. They seemed to have no sense that they ought to be working with the staff from Evergreen, or really to have an idea what they ought to be doing. So they mostly hung out and chatted with each other. 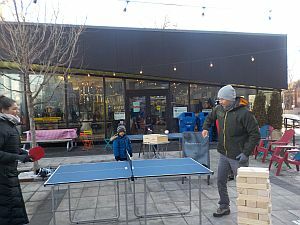 This means that the regular staff of Regent Rink may have learned very little about this "place-making" that was supposed to be happening as a partnership between the City and Evergreen. One hopeful note: there was often at least one rec staff person out on the ice helping kids with the sledges, which were a hit. Will the Regent staff use them again? Or will they do anything special again? Very hard to know, but fingers crossed. 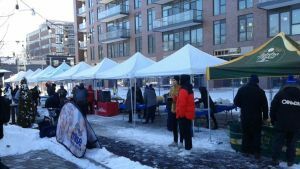 Skate exchange this Saturday from 11:00 am - 2:00 pm at the Regent Park Athletic Grounds. The Friends will be providing some tasty treats. Hope to see you there. 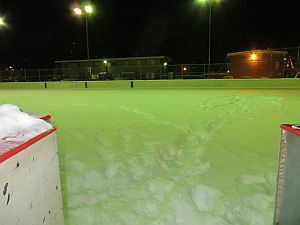 The rink has been marked as open until yesterday and then it was listed as "snow removal in progress" (with over 25 cm of snow). At 1 p.m. it was again listed as open. 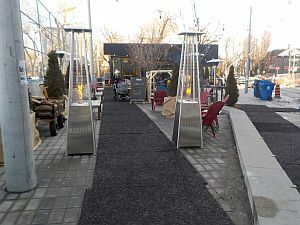 The second Friends of Regent Park event, 7 to 9 pm. Another bad weather forecast (rain mixed with wet snow) that didn't happen until much later. Fewer people came than on Family Day but even so, 40 pairs of skates were loaned out and the scene on the ice looked like fun. Two volunteers from the Meridian Credit Union were very busy helping new skaters (they came on Family Day too). The poster is here. More photos and stories here. A joyful day: and it never really rained until after the event was over. More photos and stories here . Perfectly maintained ice, but no one on it. The staff member in the 'rink house' said the number of skaters really fluctuates. 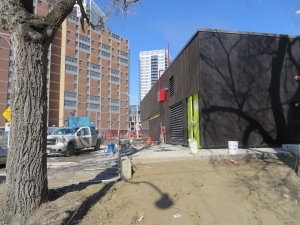 Washrooms open, big empty space inside. One skater arrived as I left and began playing shinny on his own. The staff said if pleasure skaters came at the same time, if it was quiet, he lets them share the ice. 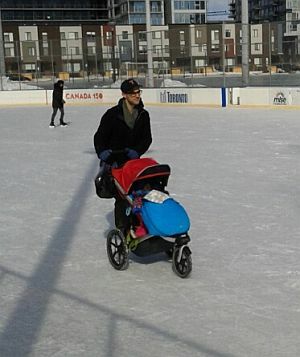 A Family Day skating event is planned for the rink on Monday Feb.19, 2018, more news to follow. 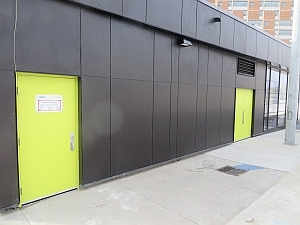 There are many partners involved here: Artscape, Daniels Corp., CRC, the Daniels Spectrum CSI, Dixon Hall, Parks and Recreation, MLSE, TCHC, and Hockey 4 Youth. CELOS is lending the skates. 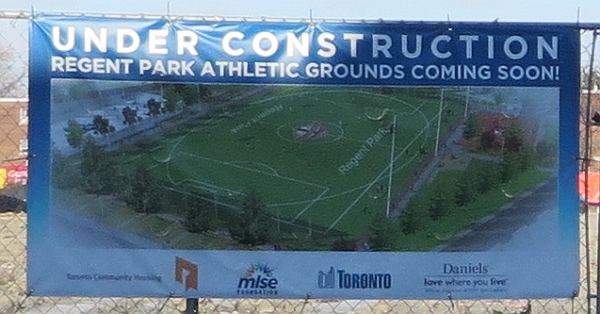 Friends of Regent Park (FORP) is coordinating the event. 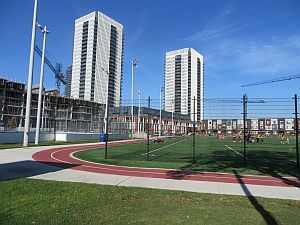 On Fridays between 4.30 and 6 there's a program called "Hockey in the Park," a sequel to the old MLSE "Hockey in the Neighbourhood" program. Tonight there were about 25 little kids in three different groups. A group of mostly little girls were skating around -- unsteadily -- in the middle group, with their hockey sticks, while a female instructor urged them in a slightly exasperated way: "the puck! Don't forget the puck!" The girls fell down a lot. Skating with a stick is one good way to learn to skate, and maybe that's what their moms -- engaged in animated conversations inside the rink building -- thought when they enrolled their daughters. But keeping your eye on the puck at the same time as you're learning to skate is a bit tricky. So there were a few pucks just languishing on the side. The kids looked like they were having a good time, and none of them made a fuss about falling -- even though they didn't have the benefit of hockey pants to pad their falls, like the full-equipment kids do on Wednesdays. 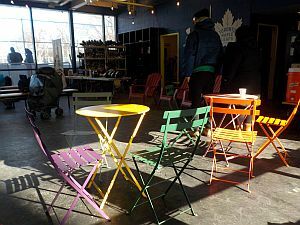 The two regular staff were sitting behind the counter as usual, instructors were out on the ice, and there was another staff person who introduced himself as the LSC, which stands for "leisure skate coordinator." He was there to make sure the Friday night program was running well, and he patiently answered my questions about the program. It's shinny hockey, he said, and the kids don't have to bring their own gear. 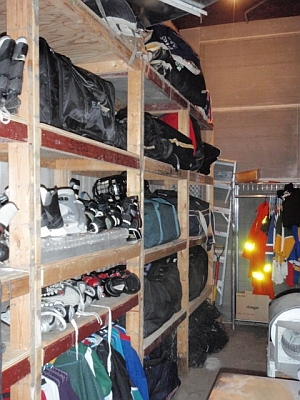 The skates and the sticks and helmets for the program are all kept in the storage room except on Fridays. He had just cleaned it up, and when I said that would be impossible, considering the messy state it was in on Wednesday, he pulled out his cell phone and showed me. The photo had a whole shelf of skates neatly organized, and enough cleaning supplies on the other shelves to last a year. When I asked if I could see for myself, he said no, he's been told he's not allowed to show me the inside of the room, and the other staff said they had been told the same thing. Tonight was the regular Wednesday evening Regent Park Community Center hockey skills program. What a lively scene! 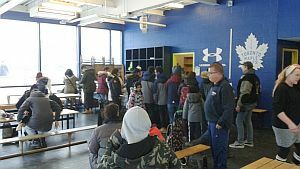 The change room was full of Moss Park league kids with their legs stretched out for a parent or friend to tighten their skate laces, or -- in a few cases -- to strap them into their goalie gear. Neither of the two information staff helped out with getting the kids on the ice (skates laced up, helmets fixed, goalie pads on, etc.) -- it does seem like they are really told to behave mainly as security guards. 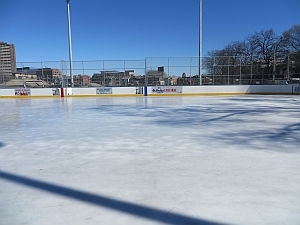 They have a Winter Classic Tournament booked for kids and youth on Saturday February 3. The poster shows two kids in full gear, with snowflakes flying around them. The scheduled games are: 8 a.m., 9 a.m., and 10 a.m., and then 12 noon, 12.55 p.m., and 2 p.m. "Refreshments served." 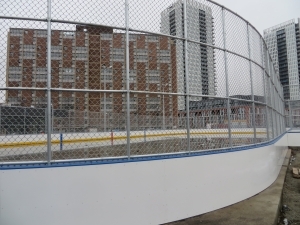 Regent Park South Rink [December - February] Full Equipment Mandatory! 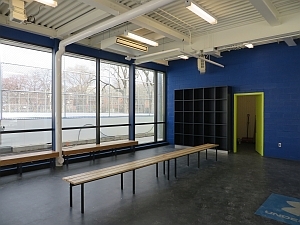 In partnership with community members, the Regent Park Community Centre is committed to the promotion of equitable access to organized hockey programs for children residing in the local community. 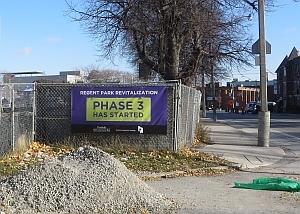 The philosophy espoused by Regent Park Community Cenrte and its members is reflective of the principle that every child should have the opportunity and access to the resources necessary to ensure their participation and development. These opportunities are seen as an investment and provide children regardless of social status, nationality or gender with opportunities to grow morally, physically, socially and emotionally in an organized and structured environment. I asked to see the storage room, to see if there's not enough space for the skates on-site. Permission was declined. 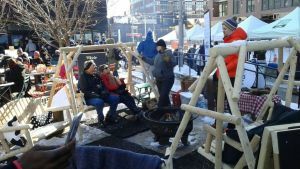 We've heard that there is a willingness to "make this work" -- meaning for sure there is to be a Family Day event with skate lending and hopefully two more events of 3 hours each, with Artscape supplying the DJ, Daniels Corp providing hot chocolate and cookies, and the city helping with promotion. 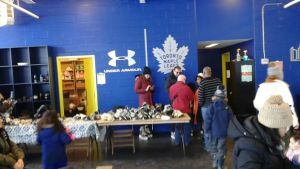 Cityrinks.ca has donated the skate collection, helmets, sticks, record-keeping binder etc. 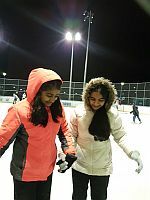 to the Friends of Regent Park, and funds from David Rothberg's donation will help them pay for doing the actual skate lending on the day(s). 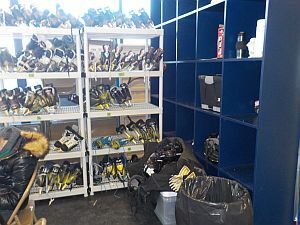 So the skates that would have been available for use at the rink every day since Nov.27 will stay in storage, somewhere, the rest of the time. The two existing rink staff will continue to sit behind the rink change room desk with nothing to do most of the time. 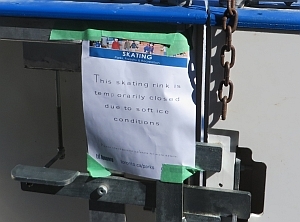 So there will be no city-run skate lending at Regent Rink this season. Meeting notes here. Rec management says that skate lending is not part of their core business. 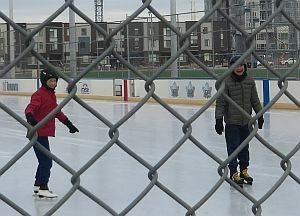 Dec.11, 2017: Jane: "we are seniors having fresh air"
A mild winter day, late morning, with two staff inside the building and two skaters out on good ice. One of them comes over to the fence when she sees me looking, and we start a conversation about different rinks. 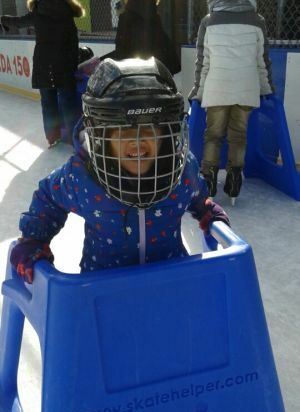 She says she's heard there is a synthetic rink at Ontario Place, and idea that doesn't impress her. 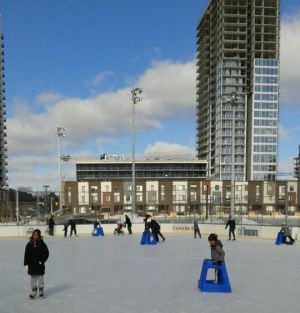 One of the rink staff told her that the new renovated rink at Riverdale Park is about to open, that it has a skating trail. It sounds nice, she says, but Regent Rink is the one closest to where she lives, and they would rather skate there. She says her name is Jane, and I introduce myself as the person who has been talking about city staff doing skate lending at Regent Rink. She's read the story, and says she really agrees with it: "it would be good thing," and waves her husband over to introduce us. They are very agreeable to having their picture taken, and she says "say we are seniors having fresh air." .....about starting a skate loan program at Regent Rink in time for the holidays. The meeting notes are here. Next meeting is on Monday Dec.11. At 8 p.m. there were 11 shinny players on the ice, 12 waiting their turn in the boxes. A fast, fun-looking game. About half the players wore helmets, the other half not. A few players were clearly under 18 (the time slot) but were so fast that they fit in easily. The two staff said there are various permits for hockey for kids. 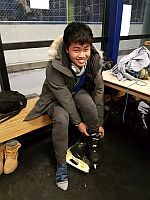 On Tuesday the permit is run by Dixon Hall, and is mainly a shinny game but there seem to be funds to buy skates for kids that don't have any. 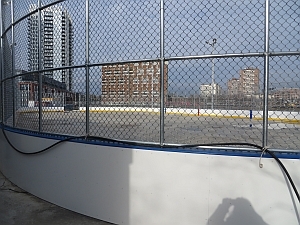 On Wednesday there is a full-equipment hockey time with mentors, run by Jim Stoner, for kids from Moss Park. On Friday after school there's hockey in the neighbourhood, also full-equipment, run by a rec staff named Rick. The two staff said that adults often come and ask if they can rent skates, but of course the answer is no. They said the kids wouldn't ask, they just wouldn't come if they don't have skates -- renting them is not a concept for them. 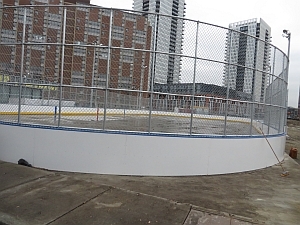 1 p.m. ice in good shape, nets off, no skaters! cubbies for skaters to store their shoes? At 1 p.m. there were two staff in the building, no skaters. At 1.45 a skater came and skated around for 10 minutes, said he had a good time, was just getting back his skate legs, got his shoes on and left. No more skaters then (we left at 2.15). One of the staff said that if I was cold I was welcome to stay in the rink change room to get warm. Was that comment from an training session about homeless people? 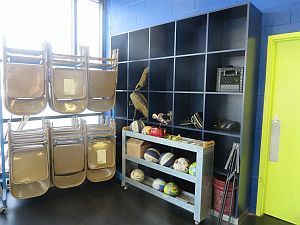 I took a photo of the cubbies, which seem to be used for storage of mostly un-rink-related items such as basketballs. One of the rink staff said that photography is not allowed, and he was unsure whether that was a general rule or only relating to taking photos of people. Two of us spoke to the staff about the possibility of skate lending at the rink. After a while a third person wearing a staff shirt came and just stood at the counter. She said she is not a rink staff nor a CRP. At 2.30 p.m. the rink has no skaters. A building attendant and his friends are sitting behind the information counter indoors. The staff person says there has been only one skater all day. 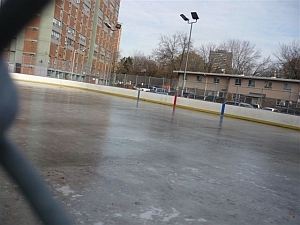 The elected city councillor for this rink, Pam McConnell, died on July 7. City council chose Lucy Troisi as her interim replacement today. 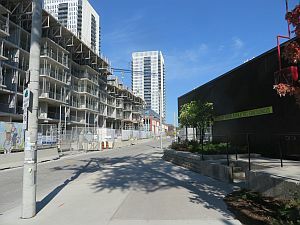 The rink house, whose sign says "Regent Park Athletic Grounds," is now in a very different context, surrounded by new buildings, with intensive construction continuing. 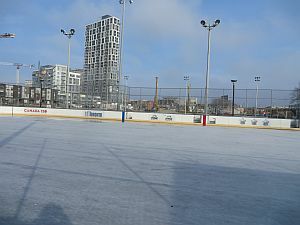 To the east of the rink, there is a large sports field covered with artificial turf. 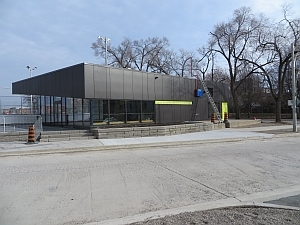 Oddly, the city's web page for the rink still shows the old rink house. 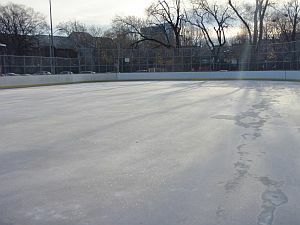 At 12.45, the rink surface is closed. The building is open but hard to get to. 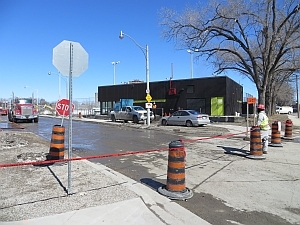 All the roads to the north and the west are closed for various unrelated construction projects. Even a bike has trouble getting through to the rink. Staff are non-committal about why the rink is closed so early when the temperature is still only plus 1. But the March sun is high in the sky. maybe the ice is thin? 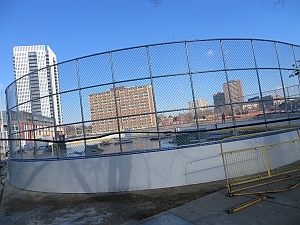 The rink ended up opening on January 3. Tonight (Jan.15) there were two building attendants sitting behind the desk inside the rink house plus one security staff perched across the room (hired by the Daniels company). Outside there was a lively shinny game -- the players looked to be in their mid-thirties, about half of them wearing helmets. Inside none of the staff had anything to do, and they looked bored. But the rink attendants were friendly, and one of them said he had been at the opening ceremony. He said there were a few retired Leafs players there, and the snow /rain didn't start until the ceremonies were over. Three staff were working with a hose to make ice. 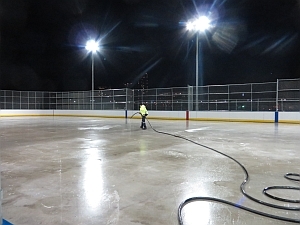 They acted pretty surly when asked whether the rink would open tomorrow ("call the supervisor") but they did admit that they would be making ice all night. One of them said they had only begun today, but there was a good layer down already and if they keep on putting water down in thin layers, they ought to have a good sheet on the slab by morning. 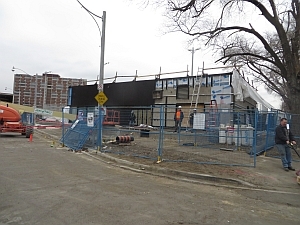 Not sure what the sudden hurry is, since Councillor McConnell said the rink would have a formal re-opening ceremony on January 3. The Cabbagetown Residents' Association newsletter has a poster about the official opening, on January 3. We'll check back. 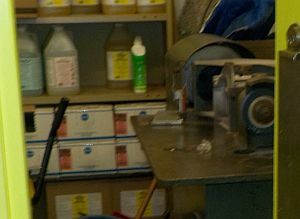 rink compressor is on -- ready to flood? The skating area of the rink looks like it's done, new boards, new kickboards along the bottom, lines up the sides. 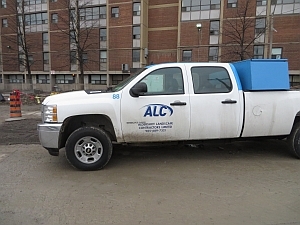 The contractor is ALC, which stands for Aldershot Landscape Contractors. 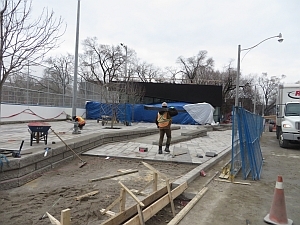 They may have done landscaping only at one time, and they did the paving all around the building and were just setting some small trees, but the foreman told me they did the rink boards too -- so they've expanded what "landscaping" means. Mostly their crew was packing up trash and tools and putting them into trucks. 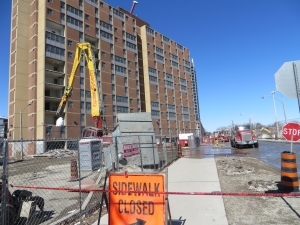 The foreman said he heard that the city is planning to start up the cooling plant on Wednesday. There was still a lot of work going on inside the renovated rink house, looks like flooring is being laid and painting is being done. The puzzle is, what happens next? The rink house was a very nice, very bright and roomy building when it was rebuilt in the 1990's but it quickly became a slum. 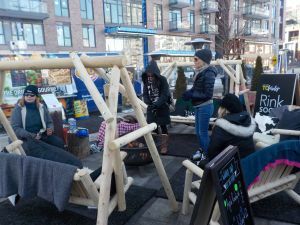 What was lacking was good programming to make a welcoming social space and bring more people in. This rink has been underused from the beginning. Will it change now? big expanse of gathering space -- will there be places to sit? 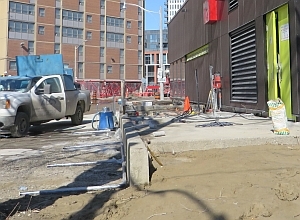 Some construction staff were cleaning up around the rink. 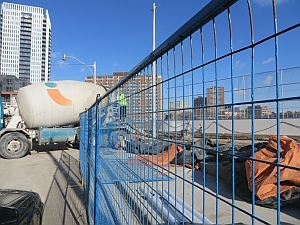 One of them told me that he is quite certain they will be finished all their work on Dec.15, and will be formally handing the site back to the city. 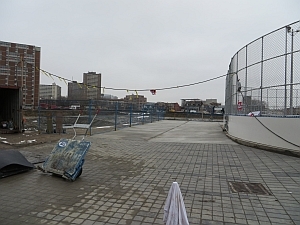 The rink pad surface is already clear (i.e the construction materials have all been removed). So he seemed to think that the plant could be turned on and ice could be made from Dec.16 on. These contractors certainly seem to hurry on their projects -- there were at least 10 people working on the site during our visit, and there were even more the time before. 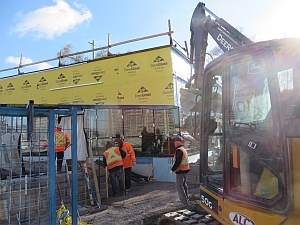 A truck was delivering tiles, a cherry-picker was in position ready to go, a low wall was being framed by a carpenter -- unusual speed and coordination for a city project! 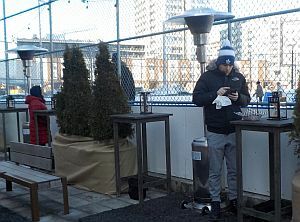 The question is, does the rink have to stay closed until the formal opening ceremony happens with the Maple Leafs hockey team? 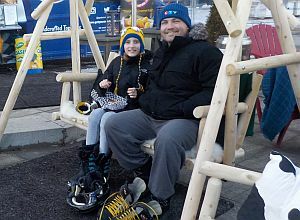 It would be a shame for local families to miss skating during the holiday season if a publicity event was the only reason. 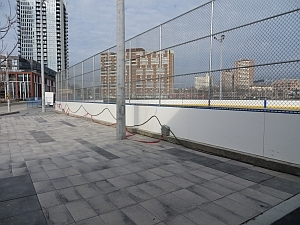 We are excited about the new Regent Park South ice rink, which is being refurbished in partnership with Maple Leaf Sports and Entertainment. 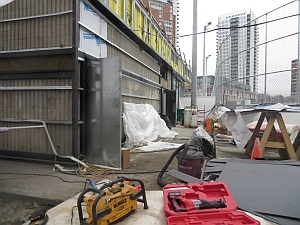 On January 3, MLSE will be holding an event to open the rink, so as far as we have been made aware, January 4 is the date that the rink will be fully open to the public. So this rink will not be open over the winter school holidays. 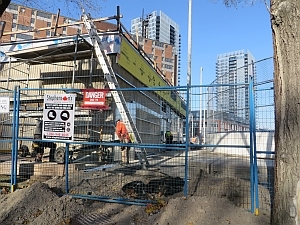 Until Nov.19, the city's website had this rink scheduled as opening on Nov.22, but that's impossible -- it's under construction, the rink pad is full of equipment, the rink house is surrounded by construction workers and a big cement truck pouring concrete at minus 9 celsius. rink house renovation --won't be done in 4 days! 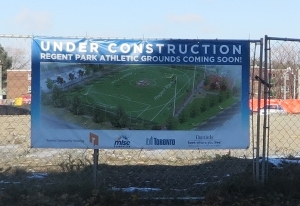 big athletic field is coming -- will the rink stay? 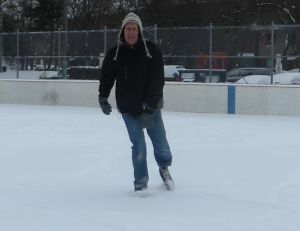 At 10 a.m. the rink has not been cleared of about 5 cm of snow from last night. A young building attendant is just arriving and unlocking the change room. He says maybe the rink will never be cleared at all today because it might snow again, and if so, what's the use? But there is one skater, making figures of eight in the snow. He says an unploughed rink is good too -- it make falling easier (softer). 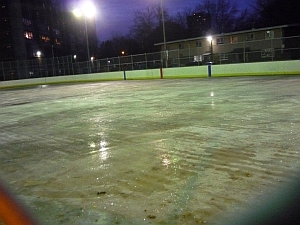 At 7 pm the city's website lists this rink as "operational." But in fact it has over a foot of snow on it. A building attendant and two friends are sitting inside. 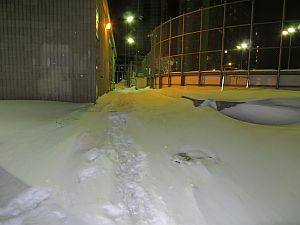 The walk is not shoveled either -- the building attendant says their shovel disappeared some time ago, so he has no equipment for clearing the walkway. He doesn't know whether he'll be getting another shovel, and he doesn't know whether any plough or zamboni will be coming by tonight. There's no phone in the building, and it looks so run down. At 9.10 am, the ice was open but the rink house was locked. There was maybe about a good inch of solid ice. No staff, and no skaters either -- and no sign on the rink announcing the opening day. A couple of mats were piled up in front of the door, ready to be laid out between the change room and the rink -- but it looked as though there might not be enough to reach. The rink, as usual, had a lot of leaves under the ice. The rink supervisor came by and said they were going to have to get some cars towed away, which had parked in front of the rink gate. That meant the staff couldn't get the leaf cleaner in, nor the zamboni. 10:45 am: there was no one there that I could talk to. I could hear the compressors running, there are mats out from the dressing room to the ice, and the dressing room has mats & benches, looks ready for the season. There was a layer of ice down, but still thin enough that I could see through to the cracks in the concrete. There were a lot of leaves frozen into the ice at both ends. there were two workers there who said it was cold enough to flood more, they'd do that soon & then there would be no midnight flood. 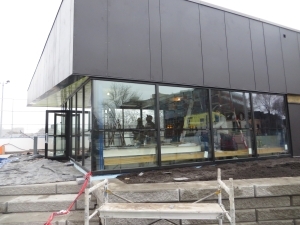 They thought it should be ready by the weekend, weather permitting. 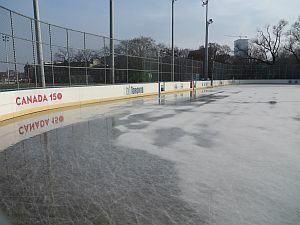 They said the rink had been ready last Sunday but then the warm weather & rain melted the ice. 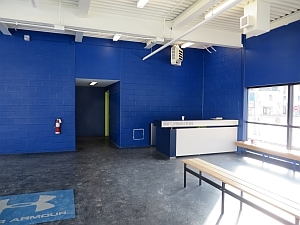 The change room is open and looks ready but there's no signs up anywhere saying when the rink will open. 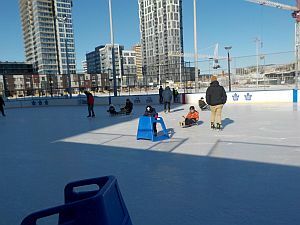 Friday Feb.3 2012 11.30 a.m.
Last week a city planner said he had been told that Regent South Rink is only open when there's a permit or a school comes. So we went to check. There were two adults playing shinny on the ice, the zamboni was just filling with water, and inside there was a building attendant. 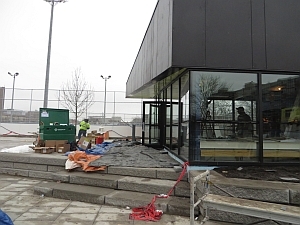 The attendant said that the rink is open from 10am to 10pm Monday to Friday, and 10am to 6pm on Saturday and Sunday. They used to be open until 10pm on Saturday but then there was a shooting somewhere in the neighbourhood and the supervisor had changed the schedule to close at 6. The reason given was "staff safety" but the rink attendant said it might have been a good excuse, to save on staff costs. 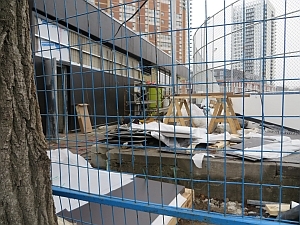 The rink attendant said they've had a pretty good season, but they've had fewer kids coming because so many of the Regent Park buildings are being torn down. There was again a problem with the roof leaking which she said was finally fixed a month ago. Apparently the previous-years' fixes didn't work and during the summer there was a lot of leakage which no one noticed because the building is only used in the winter. So the floor tiles had lifted up and had to be redone. 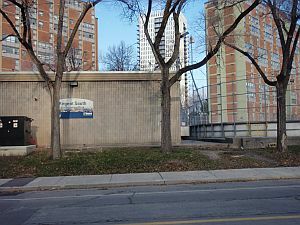 The rink attendant says that although North Regent Rink is open, almost no one uses it and women are not allowed to work there because the rink house is a "dungeon" and it's considered unsafe. We asked about the Regent South skate collection. She said it's still there but only the supervisor can get in there. The attendant said the skates are just quietly rusting in there -- they get no use and nobody asks to borrow them.